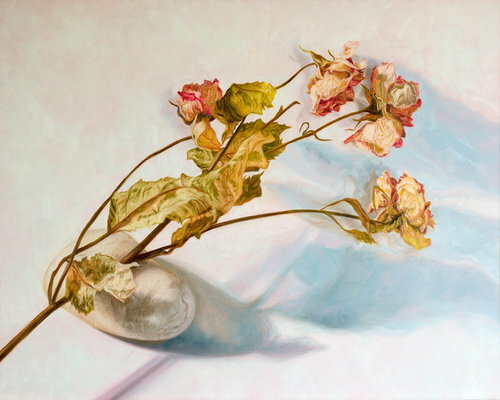 Laureen Marchand’s detailed oil paintings of roses capture the delicate essence and beauty of each flower. Visit her website for more. I always loved what I called making things, but as I was growing up I never met an artist or saw an original piece of art. Then, in eleventh grade, a new girl moved to my school—a girl who had spent her childhood in galleries and art classes. With her as my new sense of what was possible, I began college two years later as a painting major in a BFA program. Since then my art career has taken many twists and turns, but there’s never really been anything else I wanted to do. Though I’ve painted both figures and landscapes, for the past dozen years I’ve focused on roses. Roses are a symbol that everyone recognizes—of beauty, youth and perfection. Roses make us think of the love that loveliness brings. But like all that’s alive, roses fade. And if beauty causes love, the fading of beauty must signal the end of love. Or must it? When preparing a new painting I begin by arranging old, dried flowers to create a composition that both appeals visually and suggests meaning. I use multiple light sources to produce layering of shadows and intensity of color, to say something not only about the roses but also their world. I photograph them and often manipulate the digital image to achieve a desired range of colour and richness. I then work out the image in an elaborate contour drawing and mix colors in response to the photo. When I start painting, I aim to develop one area thoroughly before moving to another, so that the viewer might see clear relationships between the areas. The rest of the piece follows. Though I have two degrees in art, this way of working wasn’t taught to me in any school. It’s just what feels right. I’ve been painting and exhibiting for over twenty five years, and have more than two dozen solo or two-person exhibitions on my CV as well as over forty group shows, but it never feels like I know what I’m doing. This uncertain, oily medium, applied with a stick that won’t completely let you direct it, and placed with one slightly transparent brushstroke next to or on top of another, becomes something that didn’t exist before. You never know until it’s finished whether it’s all a big mistake or not! And you hope it makes sense. Artist Laureen Marchand invites you to follow her on Facebook. Wonderful work! I loved reading about your process…very fascinating! So glad you think they’re beautiful! Very articulate statements about your process, a process that enables you to capture such sensitive aspects of roses and of life. Lovely. Thank you! Receiving a comment like this from a writer of your gifts and CV means so much to me.